You are guaranteed a place in the class. If a class gets cancelled for any reason, we can get in touch with you to let you know. If you turn up and the class is full, then we really will have to turn you away, and that makes you and us sad. You can still cancel your place, even at the last minute. It really helps us to manage the class if we know how many people to expect. Occasionally we need to get in touch with everyone who has attended a class – for example, if someone comes down with chicken pox after the session or if there is an item of lost property that we want to return. If you’ve booked your place, then we’ll be able to contact you easily. To find out whether Movers and Shakers sessions take place near you and to book a place, have a look at our website. 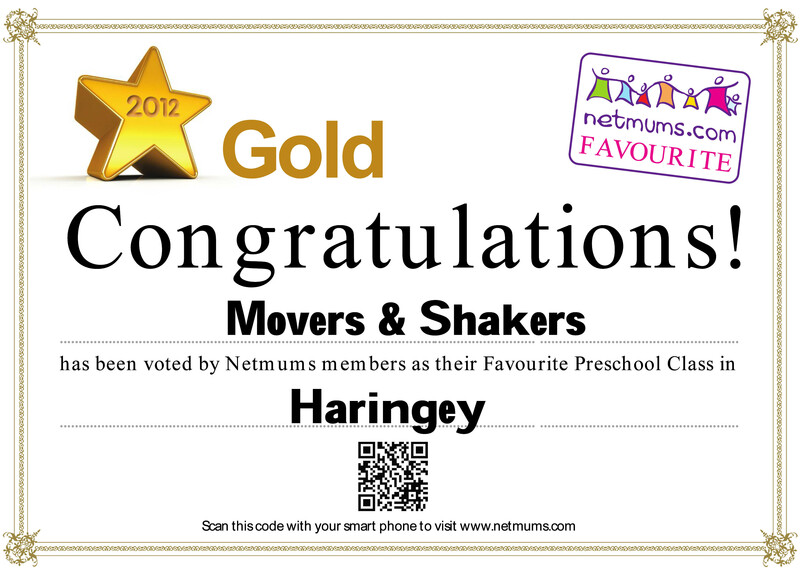 Movers and Shakers started four years ago when my second son was a few months old. I already had two failed attempts to start a pre-school music group under my belt so I was wary about giving it another try. However a Children’s Centre had just opened at my older son’s primary school and they were keen to get some groups running. The manager knew I had some experience in this area and when she asked me what my group was called ‘Movers and Shakers’ just popped out of my mouth. I’m not sure where it came from. She asked if I would run a class for a six-week trial period. I agreed and then went home to decide what I was going to do! 1) Keep It Simple. My previous classes had incredibly elaborate lesson plans, props and costumes. It took me a couple of hours to plan each class and cost a fortune in bits and bobs. 2) Keep It Cheap. There are lots of ways to keep costs down without compromising on quality. I knew I wanted my classes to be affordable for everyone who wanted to come. This meant getting groups funded by Children’s Centres and offering them to parents for free, or choosing venues with low or zero rents. 3) Keep It Fun. I had had a couple of bad experiences at groups with my energetic first son. Sometimes the person leading the group seemed not to like or understand toddlers very well (“Excuse me, could you please keep your son away from my CD player?”) or there was a sense of being herded in and out at the beginning and end of sessions with no opportunity for children to play or parents to chat. Even if the class was brilliant I was still reluctant to return. 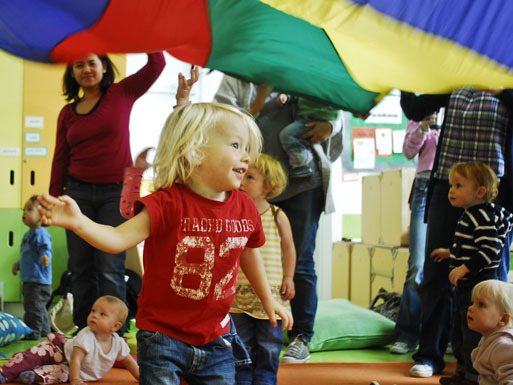 Let’s be clear about this: groups like Movers and Shakers are good for pre-schoolers. They get the neurones in their brains firing, develop an understanding of the world and routines; they teach vocabulary and a sense of rhythm and they are good place to start learning acceptable social behaviour. But are they good for mums, dads, and the others who bring their children? As a new mum I felt incredibly vulnerable at these classes. My son was not the sort of child who would sit still on my lap. He was constantly up and about, exploring the world, glancing back at me for a smile that said “It’s okay – you’re safe. I’m here if you need me.” There was one group leader in particular that insisted he sat on my lap for the duration of the session. Why she preferred a screaming child on my lap to happy child wandering around is beyond me. So, when setting up Movers and Shakers I placed a strong emphasis on the atmosphere I wanted to generate in the group. I made sure that I allowed plenty of time at the start and finish for parents to chat and children to play. When training new teachers I continue to stress the importance of a safe, fun atmosphere free from judgement. If a child switches off your CD player in the middle of a song, who cares? It’s funny! There are difficult moments, especially when a child is “experimenting with violence” – and maybe this is something I’ll discuss in a future post because it’s worth examining in more detail. If you come to a Movers and Shakers group then please leave any comments below – I’d love to hear why our sessions are important to you. Also leave a comment to let me know which topics you’d like me to cover in this blog. It won’t all be about Movers and Shakers. We’ll be looking at anything relevant to parents and carers of children aged zero to three!